The chances are that many people will have heard the phrase and that some of them will know what it means. It’s based in Room 101 at New Scotland Yard and for the Orwell fans among us, it would probably feel like Room 101 if they were especially squeamish. It’s not open to the public, only to police officers, lawyers, criminologists and others with a professional interest in crime, so don’t turn up at the Yard hoping for a guided tour and to pick up miniature gallows or an ‘I Survived The Black Museum’ T-shirt at the souvenir shop.. Aside from anybody with a particularly good reason to visit the Metropolitan Police don’t open it up to jjust anybody, although the possibility of it becoming a public attraction is under discussion. The ‘Black Museum’ (officially the Metropolitan Police Crime Museum) was founded in 1874 by an Inspector Neame and his assistant Constable Randall. It originally intended as a part of police training, giving trainee police officers a practical look at the realities of the job. In 1874 Neame and Randall started collecting exhibits, setting them up for display and preparing their pet project. which didn’t even have an official opening ceremony. It wasn’t ever intended as a tourist spot, anyway. In 1876 the first big-name visitors arrived. Commissioner of the Metropolitan Police Sir Edmund Henderson, his Assitant Commissioners Liutenant Colonel Labolmendiere and Captain Harris and some other minor dignitaries were shown round. Over the next 140 years it’s received a multitude of police officers, judges, lawyers, criminologists and the occasional celebrity. Laurel and Hardy took a look round. So dod Harry Houdini (appropriate for someone who made escaping from things a profession) and, most appropriate of all, a certain Sir Arthur Conan Doyle. The name has alswys been a nickname, not an official title. A particularly persistent reporter working for ‘Observer’ asked for a tour three times and three time Inspector Neame refused. Angry at this refusal, the hack duly filed a screed about the dreadfully tasteless ‘Black Museum’ cluttering up the Metropolitan Police headquarters. He’d probably have been more than slightly annoyed to know that his insult long outlived him. In 1890 the museum moved to the newly-built New Scotland Yard (itself rather ironically built with granite quarried by inmates at the notorious Dartmoor Prison). It still had no formal Curator (it does today) so Constable Randall was kept busy collecting exhibits, arranging displays, vetting visitor applications, arranging their visits and generally cleaning and tidying the place. The museum was closed during both World Wars and moved again in 1967 when New Scotland Yard itself moved to Victoria Street. Despite the moves, snippy reporters, world wars and so on, the museum was a part of police training when it was opened and it still is today. Even now an Inspector and a Sergeant are on permanent duty there as detectives still use it during their training. The exhibits have kept up to date as well. You won’t just find century-old crimes, you’ll also find modern ones, all neatly (and atmospherically) displayed for any visitor to look at. Look as much as you like, but they don’t let you touch (not that you’d probably want to). So, if you pass the vetting and they give you an guided tour, what can you expect to find? Plenty. There’s a selection of hangman’s ropes including one of the ropes used during Britain’s last two executions, conducted at Walton and Strangeways Prisons in August, 1964. There are 37 ‘death masks’, each a plaster bust made using the head of a recently-executed prisoner. Macabre though they are, they were used by people studying the now-discredited concept of phrenology which suggested that criminals had certain physical characteristics. If you had bumps on your head in the wrong place then were probably going to turn out bad, so went their idea. So, what else have they got? Dennis Nilsen’s stove and cooking pots (though I suspect all but the hardiest visitors pass those fairly quickly in search of something less grim). The shoes of notorious burglar and murderer Charlie Peace, letters supposedly sent to the police by a certain ‘Jack the Ripper’, a rubber apron used by the infamous ‘Acid Bath Murderer John George Haigh while dissolving his victims (Haigh himself was another Dartmoor alumnus, incidentally). There’s the rocket launcher fired at MI6 headquarters by IRA members in 2000, the ricin-loaded pellet fired into the leg of Bulgarian dissident Georgi Markov during the notorious ‘umbrella murder’ that resembled something out of a Bond movie. And many, many more, Concealed guns hidden inside innocent objects like umbrellas and fountain pens, a fountain pen that’s actually holding a five-inch blade instead of a nib, various electric ‘stun guns’, shotguns, pistols, rifles, assault weapons, explosives, poisons, drugs, you name the type of crime and the ‘Black Museum’ doubtless has an exhibit therefrom. 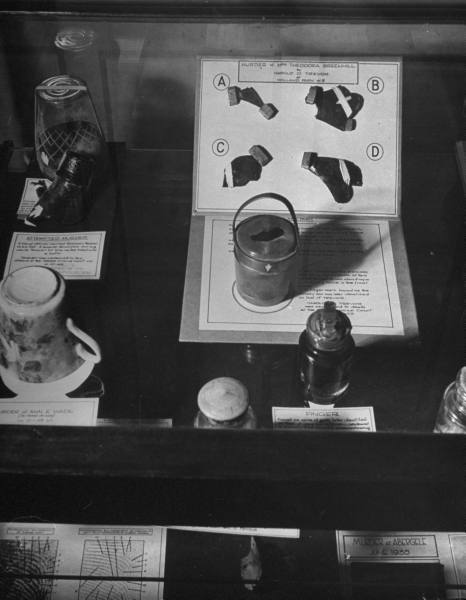 They’ve even got a couple of famous preserved brains in jars, one from a murder victim and the other from legendary forensic pathologist Sir Bernard Spilsbury, nowadays known as one of the founding fathers of forensic science. With notable exhibits come notable crimes and so notable criminals. Among, many, many malefactors (almost like a compilation of the underworld’s Greatest Hits) you’ll find displays or exhibits referencing Ruth Ellis (the last woman in Britain to hang for murder, executed in 1955), John Haigh (of acid bath infamy), John Christie (notorious for the ’10 Rillington Place’ muders and chief prosecution witness against the wrongly-executed Timonthy Evans, hanged for a murder that Christie almost certainly committed), Dennis Nilsen (the notorious ‘Muswell Hill Cannibal’ and killer of 15 men) and the equally charming Doctor Thomas Neill Cream (whose idea of fun was to feed people strychnine for his own amusement and claimed while standing on the gallows that he was ‘Jack the Ripper.’ Well, he got as far as saying ‘I am Jack the…’ before the hangman pulled his lever, anyway). The 1958 movie ‘Horrors of the Black Museum’ was about a true crime writer who committed a series of appalling crimes simply to provide himself with some inspiration (writer’s block can drive us to terrible lengths sometimes) and there various books covering the crimes and criminals exhibited there. I’ve got a couple of those in may own collection. It’s obviously not something that everybody would want to visit and rootle round in. Anybody of a particularly squeamish disposition would be advised to stay well away even if it does ever become open to the public. But, undoubtedly macabre, it does still have a practical use in police training and it offers an almost unique glimpse into the criminal mind. I’l rather like to see it myself, actually. Previous Previous post: Bill Richmond – Boxer, Trainer, Socialite (and Hangman? ).